Ex-con Riley Toback is trying to make a fresh start in Atlantic City after doing time for armed robbery. He is married and working an honest job in a garage. Life is not great, but he is trying to live an honest one. His no good brother-in-law drags him into a heist that gets botched and causes a ton of problems. Riley ends up on the receiving end when Karim Rashid makes him a proposition that he cannot refuse if he wants to keep his wife alive. 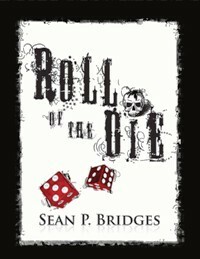 Riley is forced to be a player in a twisted game of Russian Roulette in Las Vegas. There are six players, six side die, and six chamber gun with one bullet. Players had to roll the die and the number that comes up is the number of times the trigger is pulled. The survivor of three rounds wins the big cash prize. This was a gripping tale of suspense and murder that will keep you on the edge of your seat. Each contestant was given a chapter so the reader knew why that person was in the game. The storyline was very well written and flowed nicely from the beginning to the end. It was one of those stories where once you start reading, you have to continue because you want to know what will happen next. Riley was a piece of work at times and you could still see and hear the con in him. He appears to truly love his wife and is determined to do whatever it takes to save her. The question is, will he get to her in time? If you enjoy a story full of suspense and twists and turns, you will definitely like this one. I wish to thank the author for providing me with a copy to read and review. I was not required to write a positive review. I was not compensated in anyway except for receiving the book to review. Dana, It was a great book. Thank you for stopping by my blog.